Nose: Salty sea water, peat, fresh hay, lemon peel. Very clean and compact. Palate: Lots of salt and peat. Slight seaweed and grassy notes; along with some boiled lemon lollies. The faintest notes of cinnamon sponge cake. The palate is almost entirely the same as the nose, with the added cinnamon sponge edging in right at the back. Mouthfeel: Thick, so very thick. Oily to start with, yet it dries extremely quickly as it heads to the back of the tongue. Absolutely no alcohol burn at all. Finish: Long, warming, and very dry. Peaty, salty, and very lightly grassy. Balance: Perfect. Every component of this whisky from the nose and the palate to the finish and the mouthfeel are in perfect harmony; transitioning from one to the other with nary a thought of changing direction. 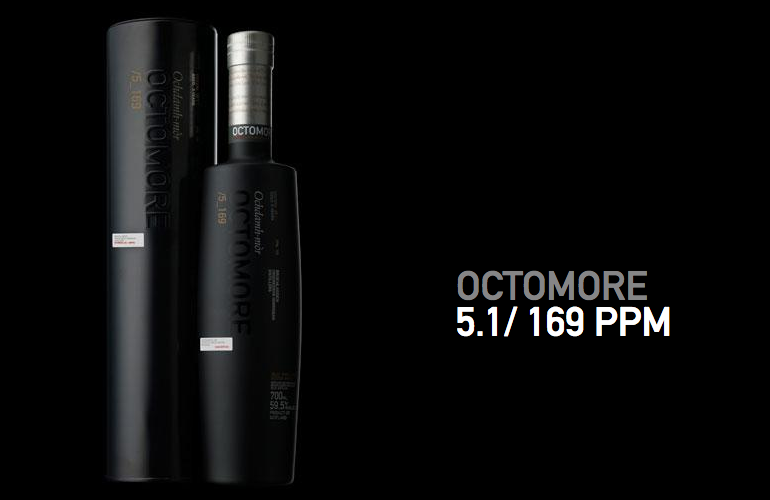 The Octomore 5.1 is the fifth x.1, and seventh retail release of Bruichladdich’s Octomore range. As usual, this release is 5 years old, and was peated to 169ppm. It was bottled at 59.5%ABV with no chill-filtration, and no colouring. Like all of x.1 releases of Bruichladdich’s Octomore, this whisky was casked in ex-Bourbon barrels. 18,000 bottles of Octomore 5.1 were bottled. This is the Octomore release that I think of whenever Octomore is mentioned. It’s not the best Octomore ever produced flavour-wise, nor in any one particular area really; but this is quite possibly the most balanced and integrated edition that has been released – the nose, palate, and mouthfeel are all in perfect harmony. This edition is without a doubt the classic Octomore. Where the Octomore 7.1, which is without a doubt the next most balanced Octomore released, slowly changes on a methodical journey from nose to finish; the Octomore 5.1 doesn’t budge one bit – the whisky does not change at all from the nose through the palate to the finish. Like all Octomore releases, this whisky was peated to stratospheric levels at Bairds in Inverness, and then slow-distilled in the tall and narrow stills at Bruichladdich, before being aged in Bruichladdich’s warehouses on the west coast of Islay. This is an absolutely terrific whisky, one that I’ve consumed several bottles of; and if you are able to get your hands on one, and are able to afford the asked price for a bottle of Octomore that is several releases previous to the current generation, definitely buy one! If you haven’t had the good fortune to try this one, and can’t find one that you can buy, you have my condolences – you’ve missed an absolute ripper.